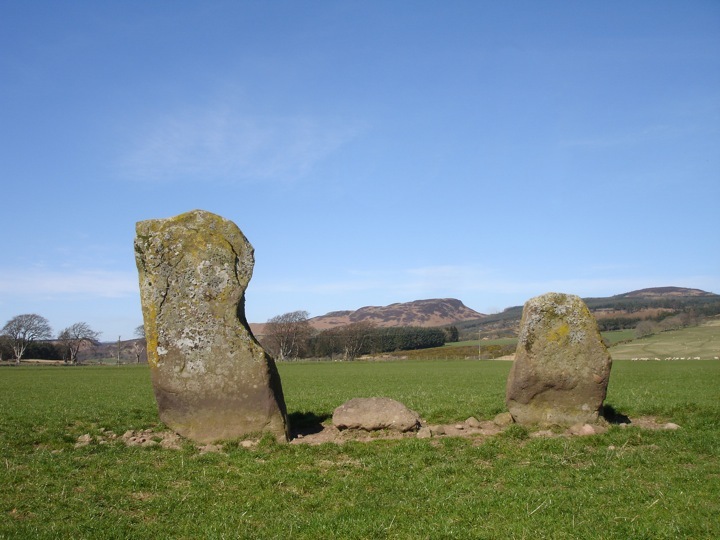 This pair of standing stones stand on the wide, flat flood plain of the Machany Water, a few hundred metres from their solitary neighbour in a nearby field. Unlike most Perthshire stone pairs, these stones are of a similar shape to one another, although there is a significant difference in size. Between the stones is a small boulder described as being earthfast, although whether it is significant or just old field clearance is unclear. The larger stone measures 2.34m in height, while the smaller stone measures 1.32m tall. The stones stand approximately 2.50m apart. Dalchirla is in the parish of Muthill and the county of Perthshire. Published on the 14th of May 2010 at 4:19 pm. Updated on the 31st of March 2011 at 7:08 am.